The good: Leptiplex Thermogenic Blend contains Green Tea and Orange Peel, which may increase metabolism. The bad: CortiSlim has made uncorroborated and fake declarations in their advertising, and CortiSlim’s capability to decrease cortisol levels has not been proven. The bottom line: Tf you are looking for an effective product, it is better to look for other alternatives. Price: UPDATE: No longer available due to lawsuits against this company. CortiSlim’s marketing strategy was that it can decrease the quantity of cortisol in a person’s body. Cortisol is a hormone that causes increase in stress levels. The intention behind the idea of CortiSlim is that stress is one of the major reasons for weight gain and if cortisol hormone can be lowered, stress reduces and it could help weight loss. The FTC was not pleased with the manufacturers of CortiSlim (and CortiStress) for a press release on October 5, 2004. The FTC contended that the manufacturers made fake or unproven claims in the broadcasted ads, print ads, and Web sites. The makers claimed that cortisol also called the “stress hormone,” is the reason for weight gain and retention. They also went on to claim that CortiSlim helps to decrease and control cortisol levels and that resulted in extensive weight loss. Results in quick, sizeable and enduring weight loss. The FTC challenged claims by the manufacturers that their product and its advertised effectiveness was a result of more that 15 years of scientific research. The FTC felt that these declarations were untrue and could not be substantiated. According to Wikipedia, the manufacturers finally settled the matter by paying $1.2 million for making false claims. On August 19, 2004 the FDA wrote to Stephen Cheng and Window Rock Enterprises, manufacturers of CortiSlim and CortiStress. The FDA warned them that their supplement is misbranded and defies the provisions of the Federal Food, Drug, and Cosmetic Act (the Act). The FDA contended that CortiSlim’s label and associated information make unsupported statements that CortiSlim “eliminates cravings,” “controls appetite,” “burn[s] calories more efficiently and naturally through thermogenesis,” “diminish[es] hunger and stress eating,” “supports healthy cortisol levels” or “supports weight maintenance efforts." Vitamin C and Calcium – though they undoubtedly have health benefits, they have nothing much to do with weight loss through cortisol reduction. Chromium is a mere 50 mcg in CortiSlim’s 50 mcg which may not be enough to help in weight loss. Most of the ingredients mentioned are only to please the eye and medical research on each of it has not been able to prove that they affect cortisol hormone. So, the formulation of CortiSlim can best be described as weak. Also, the Themogenic proprietary blend is a mere 125mg which is not sufficient enough to aid weight loss even though the ingredients are proven metabolism enhancers. 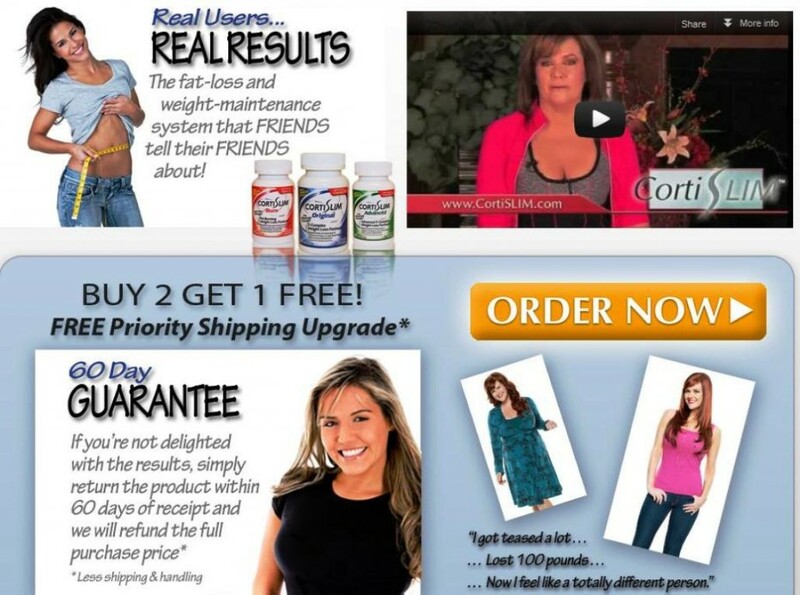 CortiSlim has made uncorroborated and fake declarations in their advertising which is misleading the consumers. Also, the claim that cortisol hormone levels affect weight is weak. More importantly, CortiSlim’s capability to decrease cortisol levels has not been proven. So, if you are looking for an effective product, this is better to look for other alternatives. I used cortislim for over 3 years and my weight stayed under control. Now that I can no longer purchase cortislim I have retained over 15 pounds of weight that I can not shed. I excercise and diet to no avail. I am 54 yrs. old and cannot afford to join a gym or a personal trainer. I think cortislim has been targeted unjustly. I am devestated that Cortislim is no longer available. Since Cortislim has been taken out of stores I have gained back 40 lbs — more than I weighed before I took Cortislim to lose 30 lbs in about 5 months. The weight is primarily in my abdomin and thighs. Help! i need whatever is in them to survive! I’ve been using CortiSlim since July of 2011…my mother had a bottle of it and with her health problems I took it out of her house/with her permission. I started taking it and I feel great. It helps me keep my sugar level balanced and I don’t crave it like I did. I also feel as good as I did when I was getting injections for suppressed adrenals. I have been searching all over the place for another bottle…I’m almost out of it. I only just became aware of the issues here. I did not know that Cortislim was back on the market. I took it for 6 mo. and I lost 40 lbs. I think the reason some people did not get the results that they wanted was this. You must listen to your body. When it tells you that you are not hungry (pay attention). I had other people ask me, one my sister she lost about 40 and a co-worker went from a size 12 to a 4. I am back on the Cortislim and will be reporting in about 6 to 8 weeks to let you know if it still works. It was hard for me to find. I am also over 50 and it is much harder to lose weight. But it worked for me in the past. Nothing else worked. Be Aware that this is very old information. The old owners of Cortislim (Window Rock) were indeed fined by the FTC for making unsubstantiated claims. In 2009, the company was taken over by new owners, the product was pulled so it could be evaluated by a panel of prominent doctors. New formulation, new ownership, and a ton of happy customers is the new reality. I started taking CortiSLIM Advanced a year or so ago. At first I noticed I was more calm. Then I felt more energetic or motivated I guess – I started being more active. Next thing I knew, I was a whole belt notch smaller on my belt! I lost several inches on my waist. I look good and I feel good – CortiSLIM sure works for me!